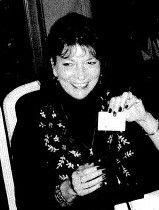 Cynthia Chandler Mendoza, 66, of Alexander, NC passed away peacefully on Tuesday, November 27, 2018 at the John F. Keever Jr., Solace Center in Asheville, NC. Born August 9, 1952 in Anderson, IN, she was the daughter of the late James and Inez Schneider Chandler. She was a graduate of Clyde A. Erwin High School class of 1970. She was employed as a paralegal with Ritter Chusid LLP in Coral Springs, FL. Of her many passions caring and rescuing animal was one of the most important. She was also an avid reader and a connoisseur of music. Surviving is her devoted spouse of 40 years, Carlos Daniel Mendoza; brother, Ken Chandler and his spouse, Pat, of Portland, IN; niece, Kensey Albertson and her spouse, Bobby; nephew, Michael Chandler; great niece, Hannah Chandler; and great nephews, Jon Roessner and C.J. Albertson. No services will be held at this time. In lieu of flowers, donations may be made to either, CarePartners Hospice, 68 Sweeten Creek Road, Unit A, Asheville, NC 28803, or The Humane Society, 14 Forever Friends Lane, Asheville, NC 28806.